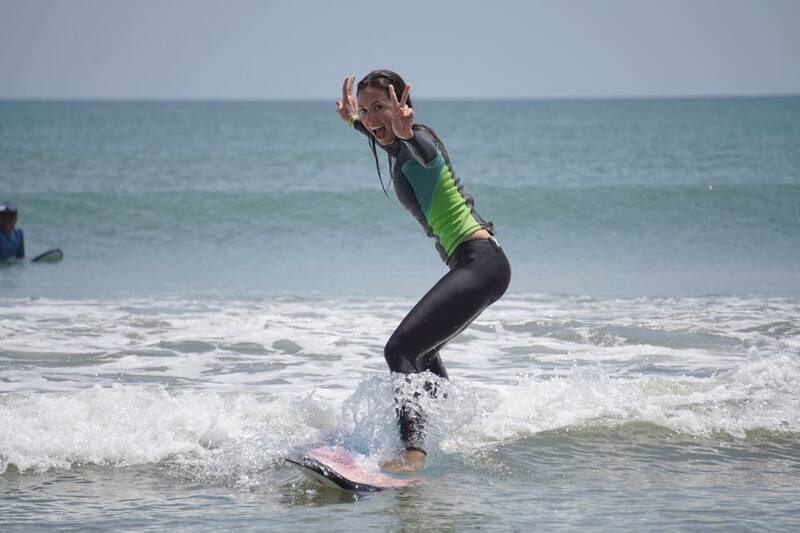 Our top rated surf program has been perfected by our head coach and instructors for the best step by step surf lesson program for women in Bali. Learn at your own pace in a noncompetitive and fun environment. 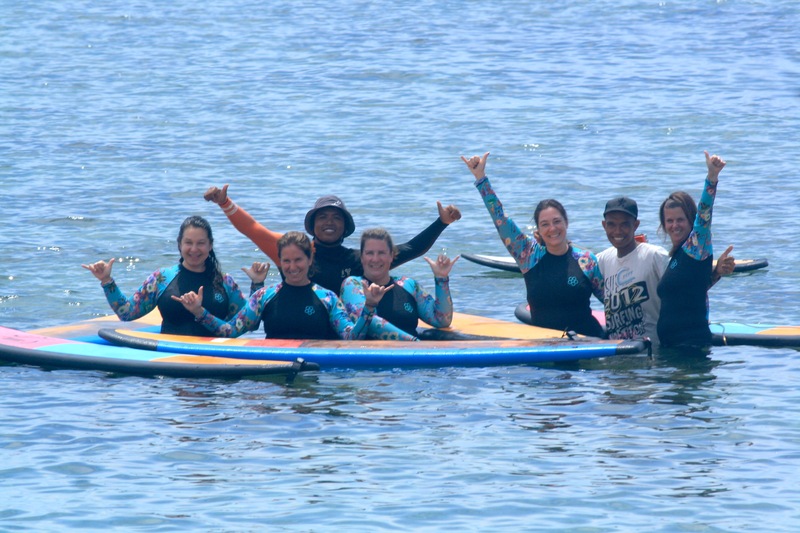 Our instructors go above and beyond to make you feel comfortable, safe and get you up on a wave, all while laughing loudly and having a great time. We have created the perfect surf retreat experience to learn this sport with the best instructors in Bali. They pride themselves in having the reputation of being the most patient, attentive and knowledgable coaches. Their top priority is keeping you safe and helping you learn and master the art of surfing in a safe environment. 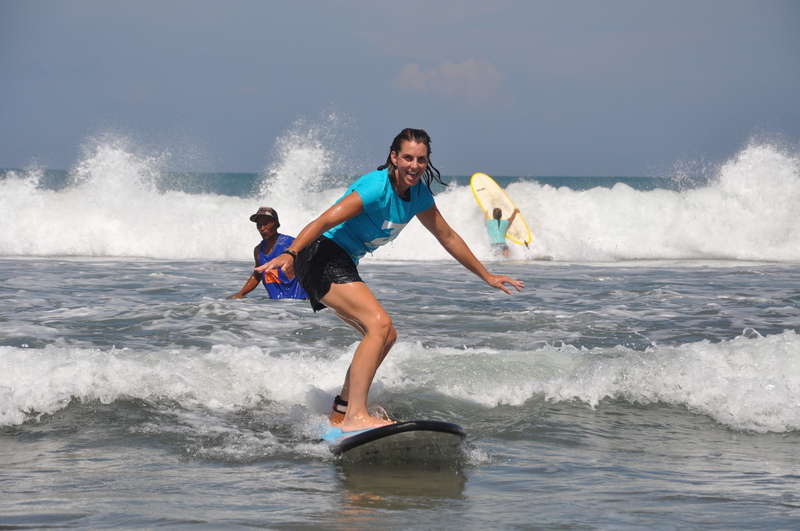 We offer 10 hours of semi private surf lessons with expert instructors at our Bali surf camp. Together with your in water surf instructors and on beach personal surf coach watching your every move, we pay very close attention to every little detail during your surf lesson to make sure you are getting the best surf experience out of each lesson. We believe 1 coach for 2 guests allows for faster learning, maximum safety and individual spot attention in the water. 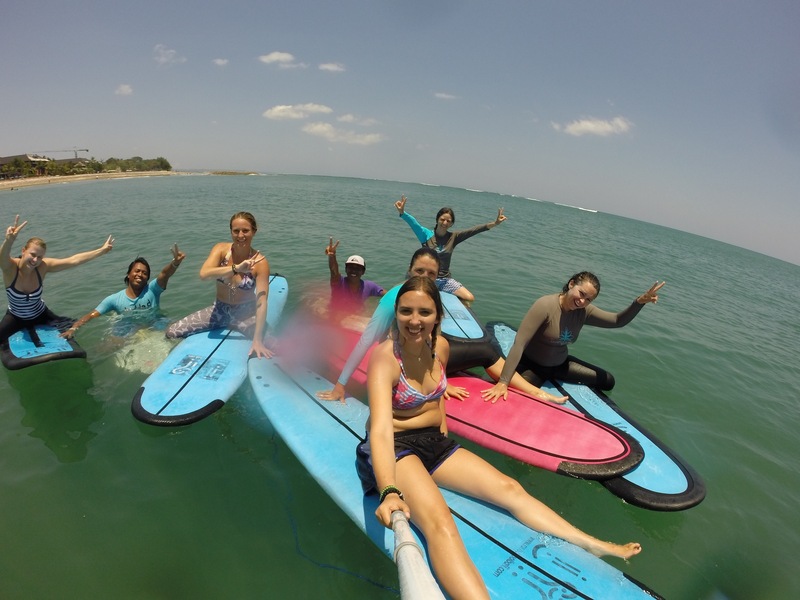 We are the only women’s surf retreat that offer this student / coach ratio. We will be pairing you with a partner of a similar surfing level and tailoring the lesson to fit your personal goals to ensure you progress at your own pace safely. You will have the opportunity to try different boards as you progress throughout the week. You will achieve a solid, basic surfing foundation with our personalized surf lesson program. Learning proper techniques from experts together with correct safety instruction builds the essential foundation you need to give you the confidence to continue surfing on your own after you leave our bali surf camp. Each surf lesson begins with a short gathering on the beach to discuss the day’s surf condition before we head into the water. Each lesson ends with a photo analysis and feedback session to help improve your skills and get you ready for the next lesson. Day 1 This introductory course covers all the necessary theory about the basics of surfing, safety essentials, surf awareness, board characteristics, paddling and standing up. We will take you into the water to practice these new skills and catch your first small waves. Day 2-5 We take you a step forward and help you become more confident on the board and develop techniques for board control and turning while maintaining a pace that is comfortable to you. In this course you will learn about how to read the surf such as observing the sets, timing the paddle out and techniques on how to get through the surf and into the line-up. (Subject to surf conditions) In this final course the goal is to paddle through the surf into the line -up (subject to surf conditions), select the right wave, time your take off and confidently ride some amazing waves. We have teamed up with some of the best professional Balinese surf instructors, all have years of professional teaching experience in Bali. The founder of MBS , Gede Aryadi “Deduk” is in charge of our surf program and head surf coach, together with Desu De Bali Surf they lead our surf team to guarantee a week of surfing success. Gede and Desu are certified for first aid in Bali from Balawista Bandung and are accredited to International standards. Our local beach is Double Six Beach in Seminyak. Depending on skill level and wave condition, you may travel to other surf spots for your lessons. Beginners will be taught on sandy bottoms, close to the shore. Surfing teaches you patience, self-empowerment and courage. It is a lifestyle that will keep your mind, body and soul healthy, strong and young at heart. 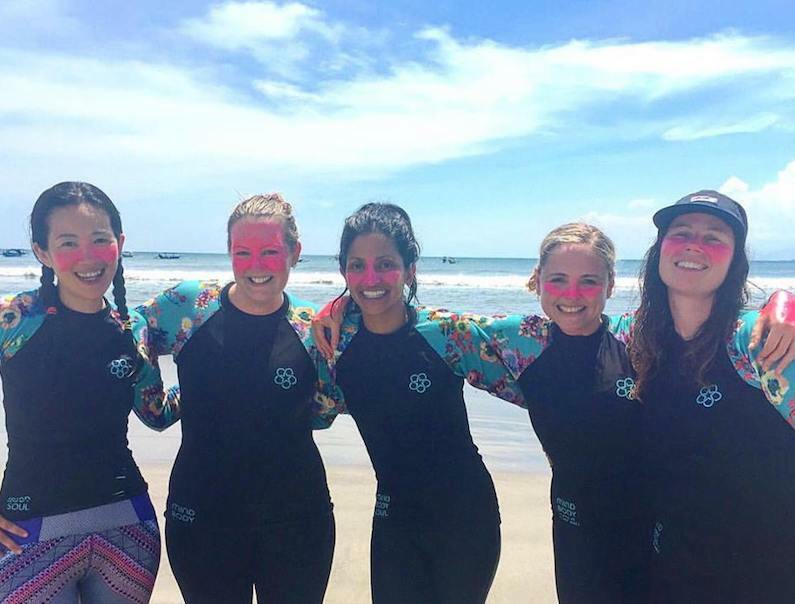 Learn to surf with like-minded women of all ages and skill levels at the best women’s surf camp in Bali.